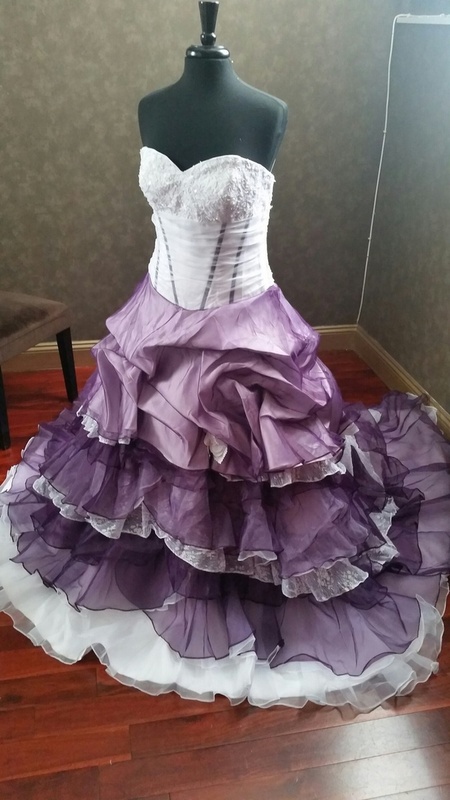 This beautiful Purple and Ivory Wedding Dress from WeddingDressFantasy is absolutely amazing. Bodice features a sweetheart neckline with French Lace Applique, Organza ruching and exposed Purple Corset Boning. Skirt is a ballgown style with Purple Organza over Ivory and layers of Ivory Lace. Shown with corset back ($75 additional). This gown is available in over 50 colors and any size. It is also fully customizable. You can make it tea-length, have a zipper or corset back ($75 additional), with or without a train, even add a bolero jacket ($100 additional) and much more. Plus sizes are additional. Simply email us with any questions. We would love to help you find your beautiful dream wedding dress in your favorite color.